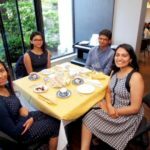 Supporters of The Prem Rawat Foundation (TPRF) have been organizing a range of creative fundraising events in Ottawa, Canada over the last few years. In this blog David Pritchard (pictured above on the left at one of the events) reports on what they’ve been up to. Prem Rawat’s vision for how the Food for People program could help people in Bantoli, India first inspired us to get involved and things just developed from there. 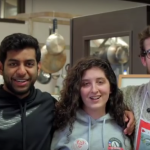 My wife owns a vegetarian restaurant named The Pantry and it has become the platform for many of our fundraising efforts. The last four years, at Christmas time, we did a series called “TPRF Day.” In early December we contributed all receipts from The Pantry to Food for People. Leaflets about the program were available, as well as a nice large glass jar for donations. This comparatively small effort would usually raise $475-600 and was perhaps our most enjoyable working day of the year. A rather unusual fundraiser involved a 19th century painting donated by someone after she rescued it from the garbage. We hung it at The Pantry and offered it in a silent auction. However, nobody showed the slightest interest in the painting, and we didn’t receive a single bid. Then, on the last day of the auction, when we had given up any hope of selling it, one of our regular customers placed a bid of $335. The fundraiser I am most proud of was a show that we staged at The Pantry. Melody Moore is a one-man show about Thomas Moore, the 19th century Irish poet and musician. 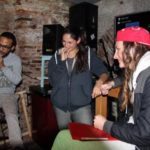 It was written and performed by Richard Hanna, an actor, singer, and artist from New Zealand, who generously offered his services because he was impressed by Food for People. We offered to stage it at The Pantry, and the dining room was transformed for the night into a small theatre with over 50 seats. We sold out at $16 a ticket. A short video about Food for People was shown before the performance, and we served tea and coffee at the end. By squeezing in some standing customers, we raised over $1,200. It was a perfect end to a memorable evening. 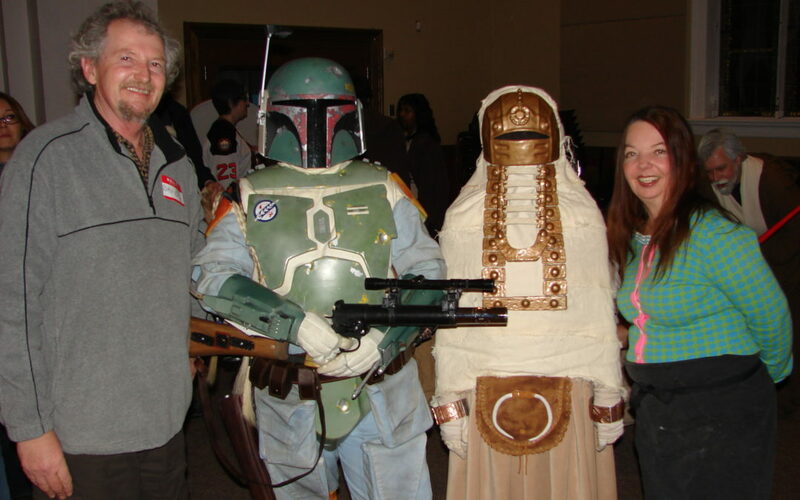 One night in 2012, we held a Star Wars Evening at a local community center. One of our team members was connected to a group of enthusiasts who dress up as Star Wars characters to support charitable events. We screened Star Wars and featured characters from the movie. We played a video about Food for People to our audience of over 200 adults and children and raised about $877. Some of these projects were collaborations between many of our local TPRF supporters. I was impressed by the dedication of our volunteers, and I am always surprised by the joy that our involvement brings to us. Considering that most of the people involved are over 60 years old, I think we did pretty well hauling furniture and heavy equipment around. As a general principal, we cover any costs associated with fundraisers, so that every cent raised went to TPRF. We tried to give good value—a meal, a play or a movie—in return for the donations. The money we raised was only part of the experience. 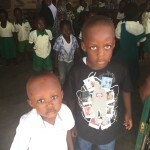 Involvement in The Prem Rawat Foundation’s work, no matter how small, adds an extra dimension to our day-to-day life. Really nice reading about fundraising and also a big Hello to David who lived in Ireland and we have fond memories of him.